Jordan flag carrier Royal Jordanian (RJ) will mark its 54th anniversary on December 15. Since the launch of operations, RJ has been receiving Hashemite support. His Majesty King Hussein's constant backing played a key role in the progress witnessed by the airline and helped it boost its competitiveness at regional and international levels. His Majesty King Abdullah II continues to support Royal Jordanian, given the leading national role that the flag carrier plays in connecting Jordan to the world and its strategic significance in serving the country. He added that RJ will keep improving its services, facilitate travel procedures and develop employees’ skills by training them according to the best customer-service standards, in addition to relying on technology in all fields, in line with international airlines. The airline will keep revisiting its route network to enhance connectivity through RJ’s hub in Amman and will simplify the fleet and thus make future growth easier. In 1963, the company had 250 employees, operated two aircraft -- a Handley Page Dart Herald and a DC7 -- and was flying to three destinations: Beirut, Kuwait and Cairo. Now its fleet counts 26 modern aircraft that fly to 44 cities spread over four continents. Ten destinations are still suspended for security reasons: Damascus, Aleppo, Sanaa, Aden, Tripoli, Benghazi, Misrata, Mosul, Suleimaniyah and Erbil. The next five years will see the launch of four new stations and more aircraft, which will bring the total number of 30 modern airliners. The number of passengers increased from 87,000 in 1964 to more than 3 million by the end of this year; the number of yearly flights grew from 4,000 to more than 35,000 over the period. Revenues also went up from JD1 million ($1.4 million) in 1964 to some JD618 million ($870 million) expected at the end of this year. 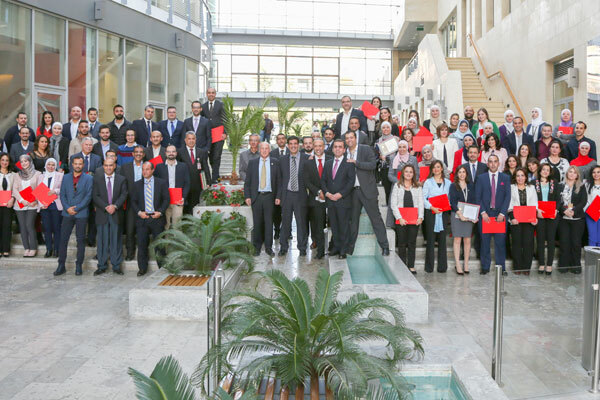 Royal Jordanian held a ceremony on the occasion of its 54th anniversary, honouring employees who have been in the service of the airline for five to 40 years.